Walking to teach my class at St. Luke's College of Nursing the other day, I stopped by one of the vegetable stalls in the Tsukiji Outer Market area. I don't have much time to prepare dinner after class, so sometimes I try to pick up already marinated fish or fresh vegetables that will be fast and easy to prepare when I know I have nothing in the fridge at home. That day, a lone orange squash was sitting amidst the other familiar vegetables and I inquired if the onion-shaped squash was similar in taste to the usual kabocha with the dark green skin. The vendor said it was more "mizu mizu shi" which translates to "juicy" or in this case I think he meant "lighter" because squash are generally not juicy or watery, like say watermelon. He said it's called aka kabocha (red squash)and comes from Kanazawa. I decided to try it. As I continued on my way to the college campus, I thought that the beautiful orange color would go well with the green of fresh sage leaves, color-wise and flavor-wise. We have a healthy sage bush in our rooftop garden prospering in the summer heat right now. Perfect, I didn't need to purchase anything else. Looking up the squash online later, this Japanese language site offered more information and some recipes. 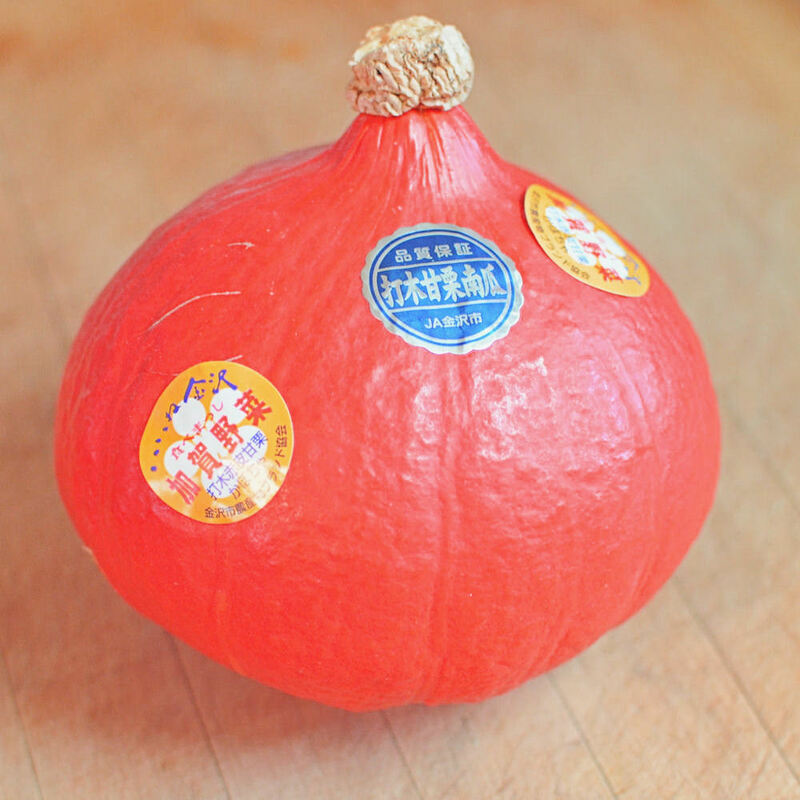 The official name of this vegetable is utsugi aka gawa amaguri kabocha. With half I made it Japanese-style with dashi, soy sauce and mirin and the other half I made with butter and sage. For both, I boiled the unpeeled, sliced kabocha in water until just tender. Then for the sage butter, I heated a pan with butter and browned it a bit over medium heat. I threw in some whole sage leaves and sauteed them to impart their scent into the butter. Then I laid the aka kabocha slices in the pan and seared them on both sides sprinkling with salt and pepper. For the Japanese style dish, I then combined dashi, soy sauce, salt, mirin and sake and simmered the aka kabocha for about 15 minutes and let it cool in the cooking liquid. The squash flavor was indeed very light; I liked it better with the butter sage rather than the soy braise. Either way, it was a nice try!